Hello, fellow Class of ’86ers. Please send an update on what’s been going on in your life. Jesse Dizard is chair of the anthropology department at California State University, Chico. The author of “Into Fez” — a book about tourism and tourists in Fez, Morocco — he has also directed four documentary films for PBS. He writes, “None of this would have been possible without the foundation laid at Brandeis. My time at Brandeis was challenging, exhilarating and profoundly transformative. I met people who have remained lifelong friends, others with whom I have lost touch but still admire, and professors who have had lasting impact on my life.” Leslie Hyman was selected by the San Antonio Business Journal as one of its Outstanding Lawyers of the Year. She is a partner at Pulman, Cappuccio, Pullen, Benson & Jones. David Kahn earned a doctorate in ethical leadership from Olivet Nazarene University. His dissertation was titled “The Value of Prior Professional Skills and Experiences: Perceptions of Second-Career Teachers.” David is in his 11th year of teaching science at Libertyville High School, in Illinois. Steve Katz, P’15, owns Sterling Care, a certified home-health agency, companion-homemaker agency and geriatric-care management firm in Greenwich, Connecticut. In October 2015, he graduated from the Executive Master of Public Health program at Columbia University’s Mailman School of Public Health. His son Jeffrey ’15 met his wife, Melany Vidret ’15, at Brandeis. Jeffrey will begin medical school in the fall in Florida. Steve’s daughter Susan attended BIMA at Brandeis last summer to explore the visual arts. Daniel Mallock’s first book, “Agony and Eloquence: John Adams, Thomas Jefferson and a World of Revolution,” was published in February. Eric Mann left Castlight Health and launched Timeboost, which helps sales and marketing leaders improve productivity. The fourth legal thriller by Adam Mitzner, MA’86, “The Girl From Home,” comes out this year. Mariel Nanasi is executive director of New Energy Economy, an advocacy group urging the Public Service Company of New Mexico to reduce its reliance on burning coal to generate electricity. Michael Resnick, who received his certificate in financial planning from Northwestern University, was conferred the CFP designation by the Certified Financial Planner Board of Standards. He focuses primarily on planning for business owners, wealthy families and divorced women. Rebecca Stern received a special commendation for her work as assistant chief counsel in the legal department at Immigration and Customs Enforcement, part of the Department of Homeland Security. She focuses on the persecution and human rights of women, children, and people who are transgender or gay. A resident of West Los Angeles, Rebecca has two children, Peter and Joel, ages 15 and 13. In August 2015, she reunited with some Brandeis pals as the maid of honor at the Boston wedding of Barry Lieber ’85 to Oscar Jimenez. In attendance were Eric London, Jay Bonnar and Marc Sperber ’85. Daniel Thomas lives with his wife and son in the Netherlands, where he teaches international relations at Leiden University. Vu Truong is CEO of Aridis Pharmaceuticals, a clinical-stage infectious diseases-focused biotech company in the San Francisco Bay Area. David Warshay is coping with the tragic loss of his beloved wife of 25 years, Amy Buchbinder ’87, who died of cancer last year. It is a very difficult time for David and his two children, Alexandra, a rising Harvard sophomore, and Matthew, who is about to enter ninth grade. David continues to work in the international software sales-management field. Andrew White, director of the Division of Pediatric Rheumatology at Washington University School of Medicine in St. Louis, was named the James P. Keating Professor of Pediatrics. Andrew earned his medical degree at University of Texas Southwestern Medical School, in Dallas, before completing an internship and residency at St. Louis Children’s Hospital, and a pediatric immunology and rheumatology fellowship at Washington University. MASS. APPEAL: As they have nearly every year for the past quarter century, a group of alumnae gathered for a girls’ getaway. 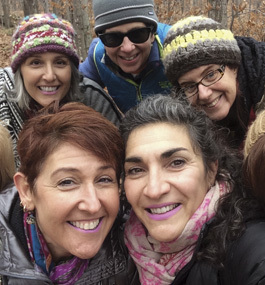 In November 2015, they met in the Berkshires to celebrate the birthday of Robyn Rosen ’86, visiting the Massachusetts Museum of Contemporary Art and Mount Greylock. From left, front row: Jill Strauss ’86, Shari Rosen Ascher ’85, Meredith Siegel ’86 and Ronni Rothman ’86. Back row: Robyn, Nancy Sullivan ’86 and Deborah Schwartz (Nancy’s wife).